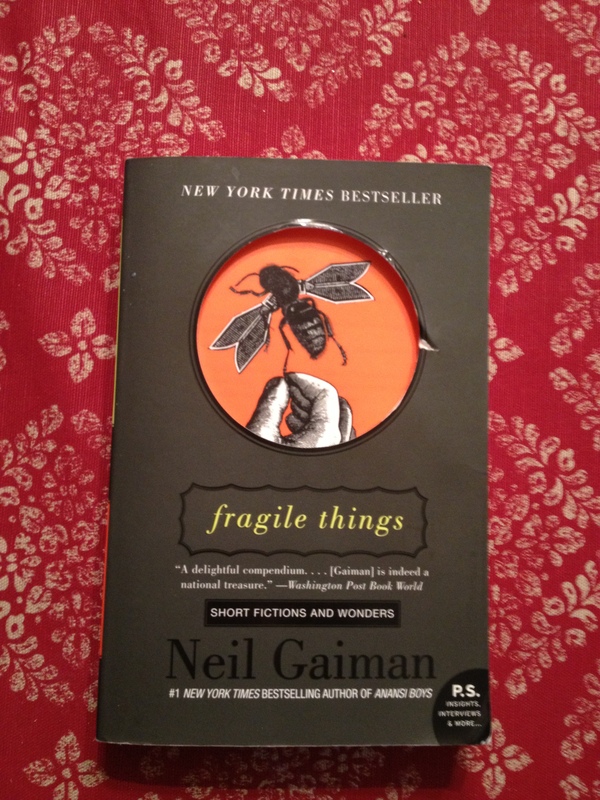 I bought Fragile Things several months ago and it sat in my to-read pile for a while. Then I pulled it out and started to slide slowly down into the short stories and poems in this collection. This is the book that I decided, with your help (Thank you SO much! 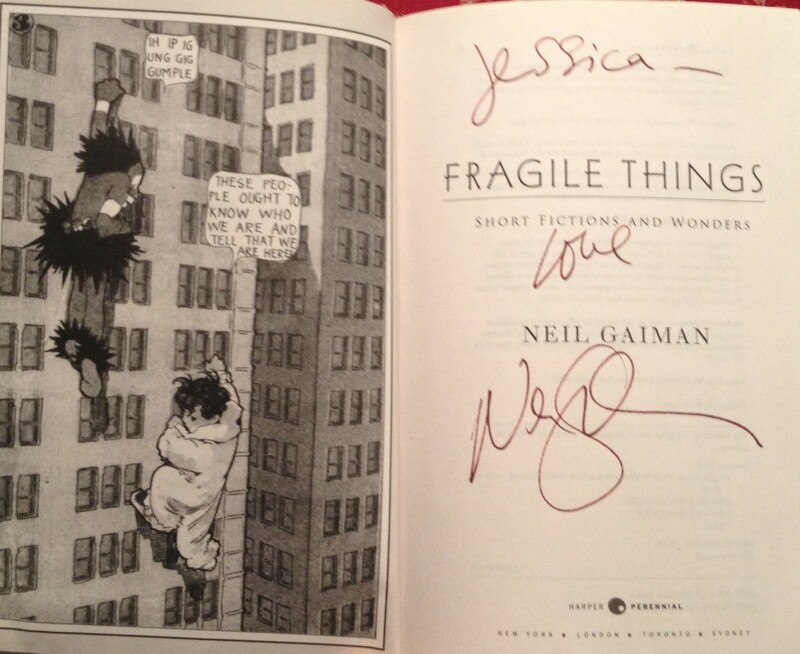 ), to have Mr. Gaiman sign for me. When I chose this I hadn’t finished reading it. I’d maybe gotten halfway through when I left it on a plane….yep, I left the sucker on the plane on my way back from Houston. What’s a girl to do? Well, this girl will take ANY excuse to go to the bookstore, so I bought another copy. Fortunately, I had time to read it before the signing, and was exceptionally sure that Fragile Things was the representation of his writing that I needed him to sign. I know it is already a bit battered (multiple plane rides, states, and bags will do that to you…I mean to a book, right, a book.) There was a moment of embarrassment over the state of the book that I was asking him to sign for me, but I thought about how I would feel if I were an author. (This not an atypical occurrence for me.) Worn means read. Thumbed through, sections underlined, notes in the margin…loved. Some books are like The Velveteen Rabbit, the love you show them is reflected on the outside. Now, I can’t say that I know Neil Gaiman, but he seems like the type of guy to understand that. I can usually skip the introductions, but I really enjoyed the insight the introduction gives the pieces in Fragile Things . Mr. Gaiman, in his short stories especially, does not only a supremely decent job of creeping me out but also of surprising me. They are dark, humorous and…twisty. The poetry though…I do so love a good poem, and this was my first exposure to any written by Neil Gaiman. The poems in this collection are filled with grace and beauty and a darkness that slowly encompasses you, rather like someone dimming the lights slowly instead of plunging you into the dark all at once. The flow and the imagery are just gorgeous. My mother is a true connoisseur of poetry. If you give her the choice between a novel and a collection of poetry, she’ll pick the poems every time. She even co-opted my Norton’s Anthology of Poetry from college. (She said she should get to read it too. She did pay for it after all. She has a point. Now, ahem years later, she still has it.) My Grandma Joye, her mother, wrote poetry, maybe that’s where this love comes from. Compared to her, I dabble a bit, but I do know what I like. I like what is in Fragile Things. I read my Mom a couple of them. (Isn’t poetry so much better when you read it aloud?) She thought they were beautiful. My nephew thought they were weird and creepy, he’s 12….he’s not wrong either. Some of the pieces in this collection, like A Study in Emerald, I’d read before online on Neil Gaiman’s website. It is a Sherlock Holmes meets H.P. Lovecraft kind of piece. What? Yes, you totally read that right. Even though I’d already read this online, it was definitely worth a re-read, and it was even more intriguing the second time around because I’d recently read Sir Arthur Conan Doyle’s A Study in Scarlet and watched the BBC Sherlock episode A Study in Pink…well, I watched it a few times. (There are only six episodes! This deserves a post all its own, and I promise it will get one…you just have to wait a bit.) A Study in Emerald definitely had its surprising, creepy, and surprisingly creepy moments, let me assure you. “From the back garden you will be able to see the wild wood. How to Talk to Girls at Parties is told from the perspective of a sixteen year old boy who gets dragged to a party that isn’t what either of them think it is. Every time I read it, I really want to know what happens to upset Vic that way, don’t you? Then there’s the piece that closes the collection, The Monarch of the Glen, that stars Shadow from American Gods. It was good to see Shadow again. I didn’t realize until the opening paragraphs that I’d missed him. Really good characters are like that, you need to visit them every now and again. I could go on and on about the pieces in this collection. There are so many things to say! Strange Little Girls, Keepsakes and Treasures, Sunbird (oh, you have to read this one!) and so many others that I didn’t want to leave out and couldn’t find space to describe. Just read it, and you’ll understand. Some short stories or short story collections I read and I feel cheated out of a novel. I’m left wanting more, as if this is only enough to whet my appetite…an appetizer instead of a meal. Fragile Things is a meal in itself…at least three courses, maybe four, and I certainly didn’t close the cover feeling unsatisfied…maybe a bit disturbed and unsettled. 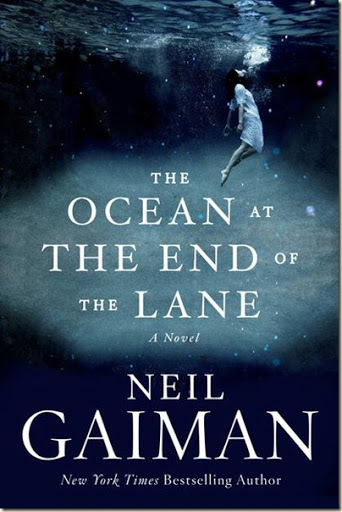 However, if we wanted puppy dogs and sunshine…of the normal sort, we wouldn’t be reading Mr. Gaiman, now would we? I’m sure that Neil Gaiman could happily write about puppy dogs and sunshine but the sunshine would be a winter sun, cold and wan, and the puppy….well that wouldn’t be a normal puppy at all. The last time, it was a Hell-hound trapped in the body/attitude of a little dog … who knows what he’d think of next, and that’s why we love him. This week’s “first lines” is a little bit different. I picked two Feeders and Eaters and Going Wodwo for a bit of a sneak peek.